Yelton Manor has two separate buildings on the same lot, the Manor and the Guest House. The Manor has eleven guest rooms and is the main building where breakfast and snacks are served for the guests in both buildings. The Guest House is a more private setting with only six rooms and no food service, except for tempting bowls of chocolate scattered throughout the Guest House's common areas. We stayed in the the Guest House in the Biltmore Hotel Suite (all the rooms in the guest house are named after former hotels in South Haven). With its sitting area, large bathroom, small porch (with an obstructed view of Lake Michigan), the suite was maybe a little bigger than we needed since we spent most of our time outside. But it was beautiful and quiet (one warning for couples who may not have been together for too long and are interested in the Biltmore Hotel Suite: the bathroom door is clear glass with more windows around it, so there is not much privacy, so that might lead to awkward moments. I'll leave the warning at that to avoid TMI). 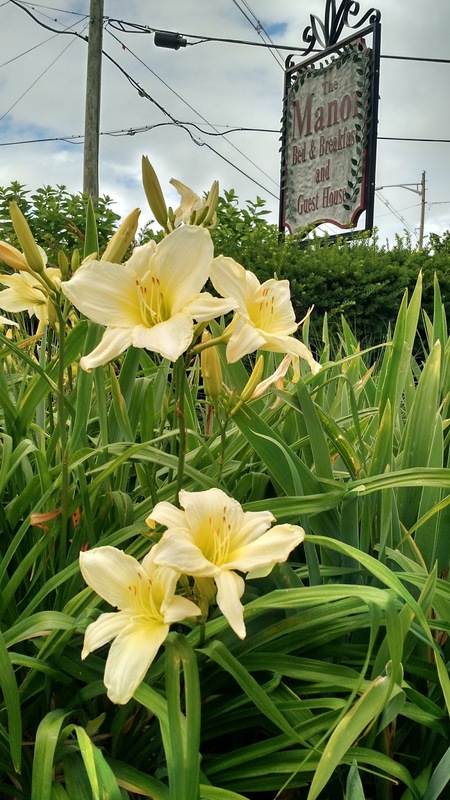 Yelton Manor not only has elegant rooms, but it also is surrounded by lush gardens full of flowers . 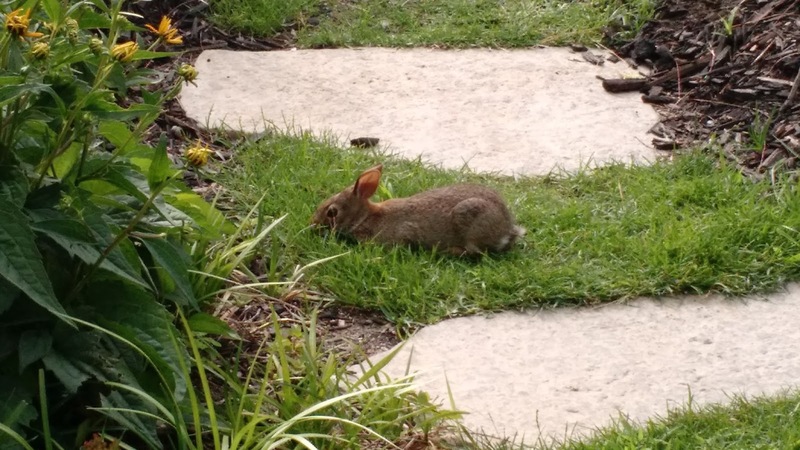 . . and rabbits. We saw several rabbits in the gardens and the patio where we ate breakfast both mornings. Yelton Manor's breakfasts were superb, with nearly everything locally sourced or locally made. I loved the hard-boiled eggs from a local hen and homemade peanut butter and jams. 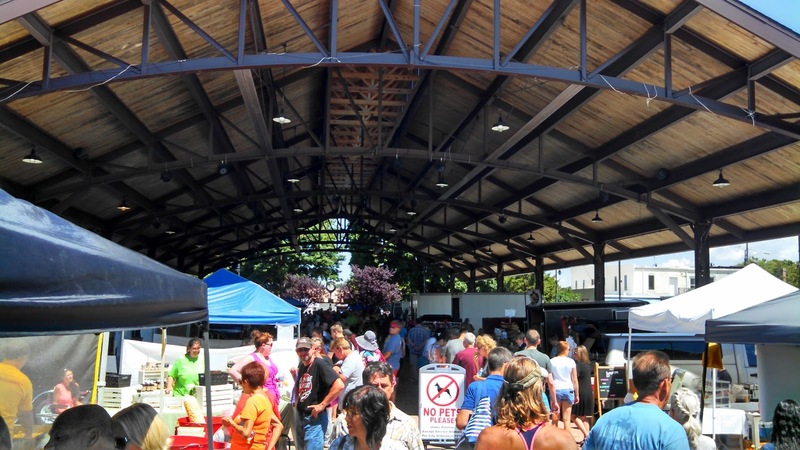 They also serve delicious brownies throughout the day and freshly popped popcorn, and they serve "beach break snacks" from 3 to 6 p.m. daily, including an excellent homemade hummus and pickled foods like pickled jalapenos. Yelton Manor does not allow children or pets as guests, but I highly recommend it to anyone looking for a relaxing getaway sans kids. 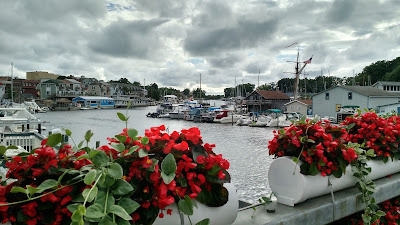 After arriving at Yelton Manor, settling in, and snacking on their breach break snacks, we headed to Taste in downtown South Haven for dinner. Taste specializes in small plates and martinis. 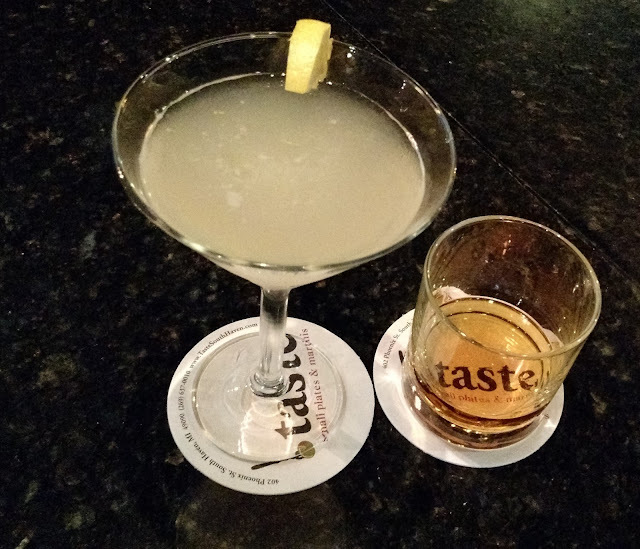 We each had a drink at the bar, Allison ordered a ginger lemongrass martini, which she enjoyed. Not being a martini fan, I ordered a bourbon to sip on while waiting for our table. We were seated at a comfortable booth and ordered cilantro tuna sushi, the chef's choice mac-n-cheese, tilapia tacos, crispy artichokes, and filet bites. Everything was good, but I especially enjoyed the crispy artichokes and the filet bites (garlic and peppercorn crusted beef tenderloin with a bourbon glaze). The filet bites were a perfect medium rare and the subtle glaze and seasoning did not overpower the beef's natural flavor. For lunch on Saturday, we tried the Phoenix Street Cafe. If I had not already eaten two hard-boiled eggs for breakfast, I would have tried something from the breakfast menu. Instead, I ordered a salmon BLT and was happy I did. The sandwich was amazing, especially the thick-cut hickory bacon. Allison ordered an omelet special that included phenomenal spicy, roasted tomatoes. On Saturday night, we felt like Mexican food, so we tried Su Casa. Even though it was crowded, we only waited about twenty minutes for a table, but we would have had an hour wait if we wanted to sit outside. Su Casa offers typical dishes for a Mexican restaurant. I had a carne asada burrito and Allison had chiles rellenos. Both dishes were quite good, and the burrito was very filling. 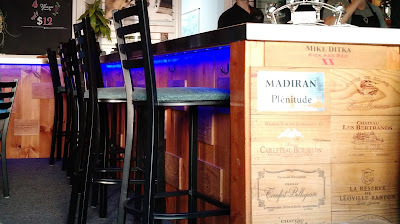 After dinner at Su Casa, we stopped at the Channel Wine Bar. We had tried to stop in the night before, but they close at 10 p.m. The Channel Wine Bar is a very laid-back and peaceful place to sip wine and have a conversation. The main room, the lounge, has an actual bar, a few tables, and a couple of couches. A second room, the gallery, has more tables and a piano. 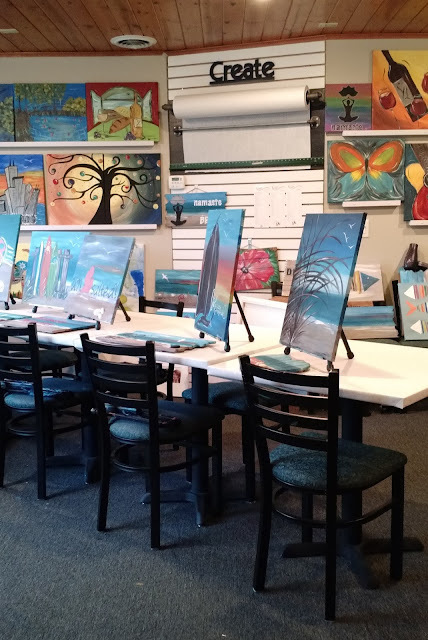 Finally, there is the Tipsy Brush Studio, where patrons can take a painting class and drink wine. We chose to sit on one of the couches in the lounge. 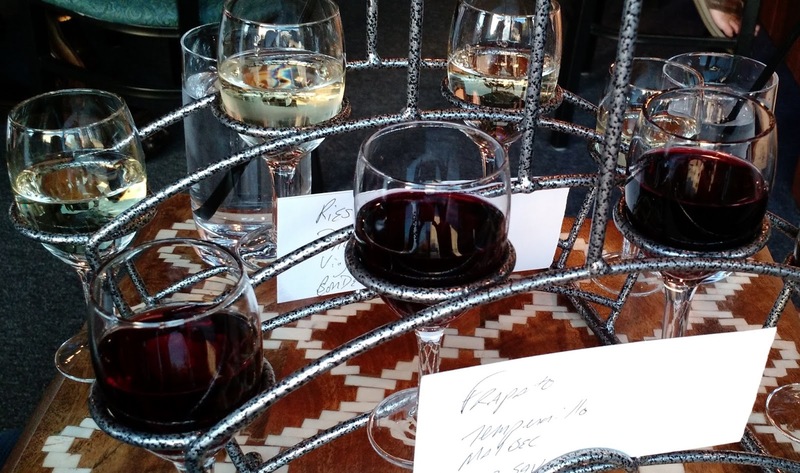 Allison ordered a flight of white wines while I ordered a flight of reds. 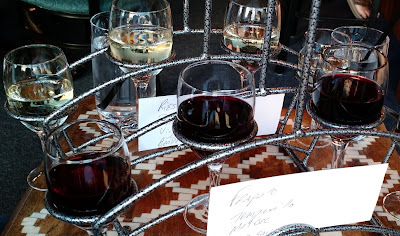 The wine bar also offers a limited menu of food pairings that sounded good, but we were full from dinner. We would have ordered more wine, but we realized that the 9:15 sunset was approaching, so we somehow found the resolve to leave the comfortable couch and comforting wine behind. Visitors cannot visit South Haven without seeing signs for Sherman's Ice Cream, South Haven's local favorite. We wanted to visit their main location and dairy bar, but it is not in the downtown. Instead, we grabbed a couple of cones of Sherman's ice cream from North Side Memories, a small convenience store and deli around the corner from Yelton Manor. I had the mint chocolate chip, and Allison had the cookie dough. It was immediately obvious why this excellent ice cream remains a local favorite. I definitely will have more Sherman's the next time I'm on the west side of the state. 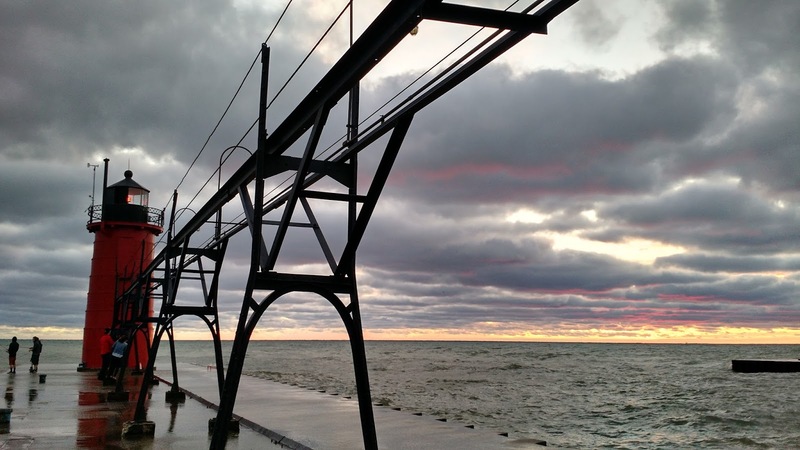 South Haven's downtown offers a lot more than restaurants. 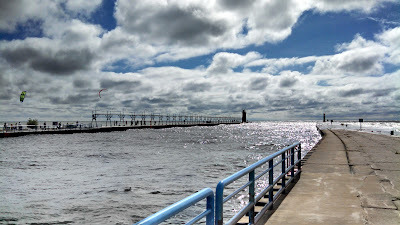 The Black River has a river walk on each side of the river leading to Lake Michigan where pedestrians can watch boats float by. There are a lot of shopping options for South Haven souvenirs, but the city also has an art center and a maritime museum. After lunch on Saturday, we stumbled upon the South Haven Farmers Market. I was impressed by this small farmer's market. 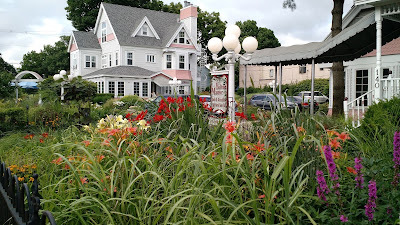 It had a lot of tantalizing food, including produce, pies, and cheese, but we did not have our own fridge at the B&B, and did not want anything to spoil in the car the next day, so we walked away empty handed. 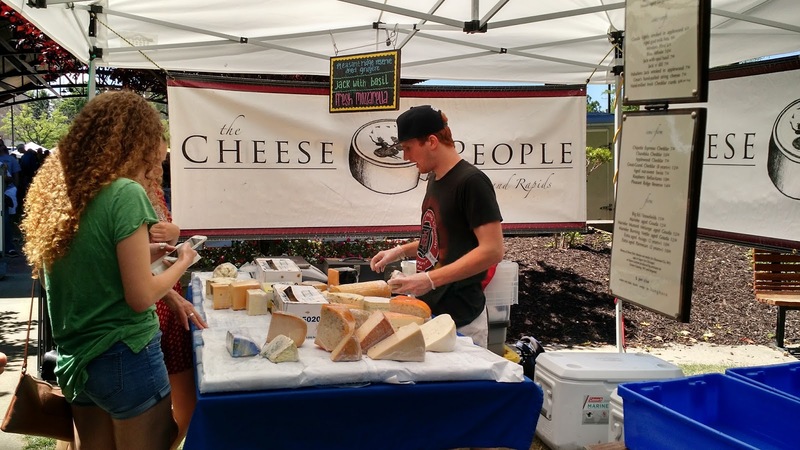 I wanted all of the cheese at the farmers market. We definitely did not see everything that South Haven has to offer. We did not rent bikes or kayaks or take a sunset cruise. I love bookstores, yet I somehow missed out on an independent bookstore in town. They also have a small theater that shows first-run movies. I'm sure there were other gems that we missed, but that only inspires us to visit again. The beach becomes narrow along the private lots. 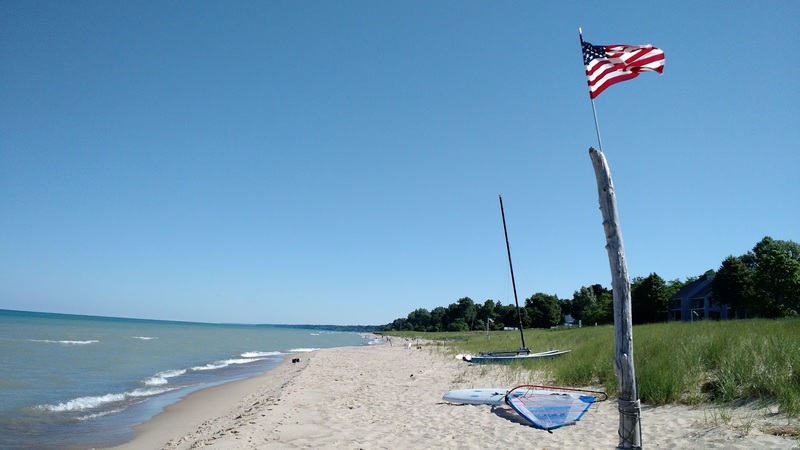 The public beaches nearest to Yelton Manor on the north side of the Black River are pretty narrow, but there is enough room to lie down and read a book, or to lay out your sandals and shirt while going for a swim. The waves were a little rough on the first night. 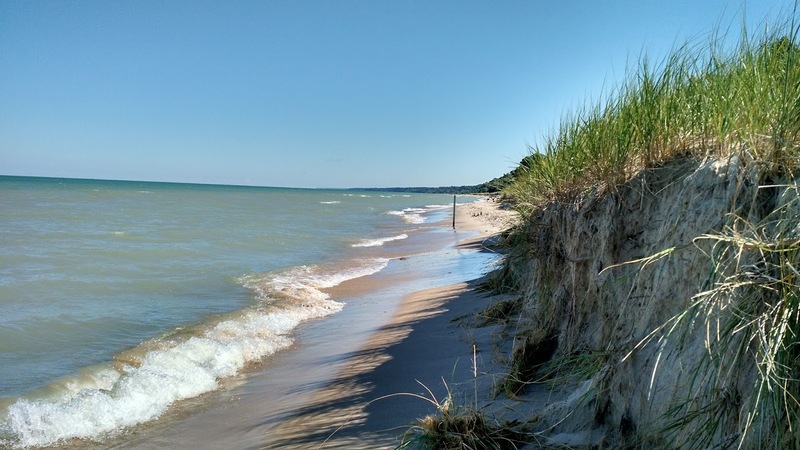 The shore is dotted with private beaches, but the general public can walk the shore up to the high-water mark without trespassing on private property. 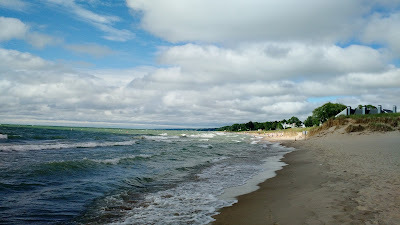 We went on a couple of long walks north along the shore with the cool water lapping our every step. Even though it was a July weekend, the private beaches north of Yelton Manor were not overly populated, and most of the private beaches were empty. The skies were clear and the waters were calm on Saturday. 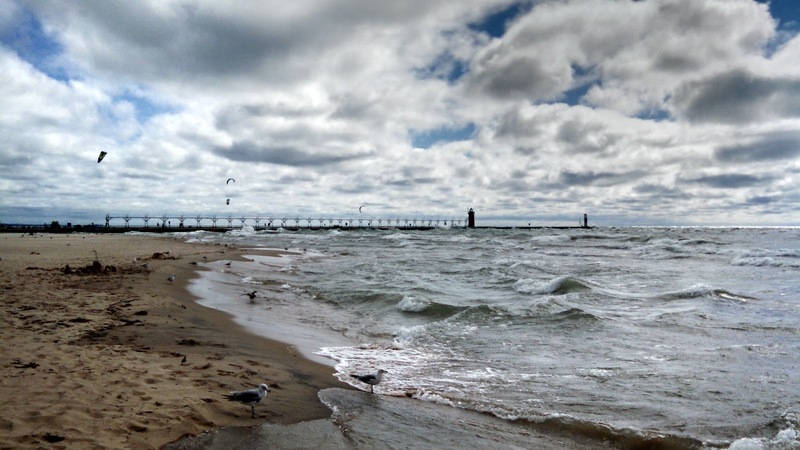 Larger public beaches sit on each side of the Black River, with North Beach on the north side and South Beach to the south. 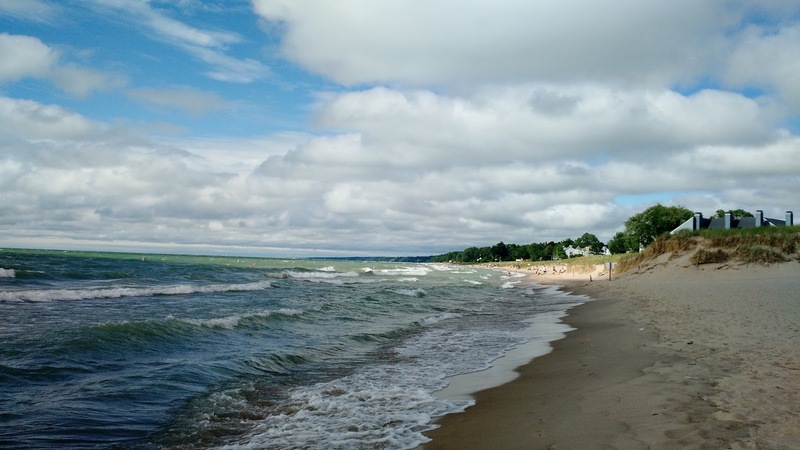 These beaches are more crowded during the day, but they offer the advantage of being closer to food and restrooms. They also have great views of South Haven's lighthouse and the boats traveling through the channel that leads from the Black River into Lake Michigan. 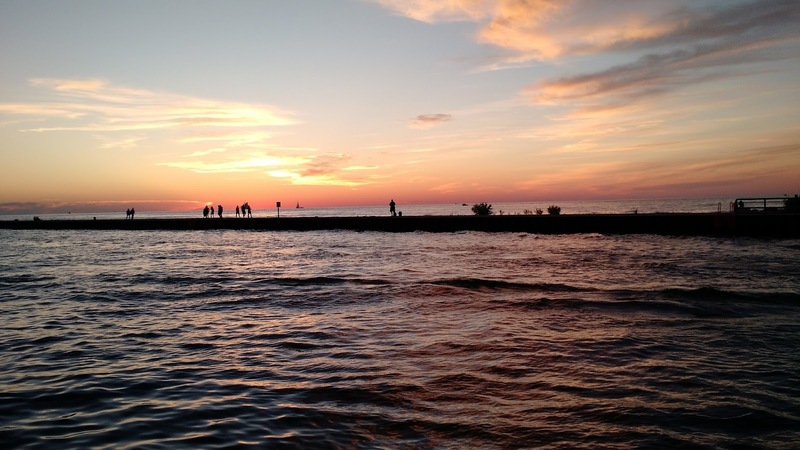 The South Haven sunsets are breathtaking. On Friday night, the overcast skies did not obscure the sunset. Instead, the recently set sun painted the clouds with a vibrant array of purples, pinks, and oranges. Saturday night's skies were clearer. We rushed down the hill on Water Street after finishing our flights at the wine bar. 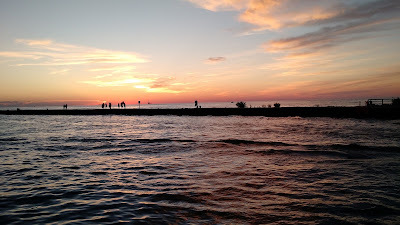 We did not make it all the way to the beach to see the sunset, but we did watch it set along the river walk nearby. This time the clouds turned a magnificent orange as the sun set. 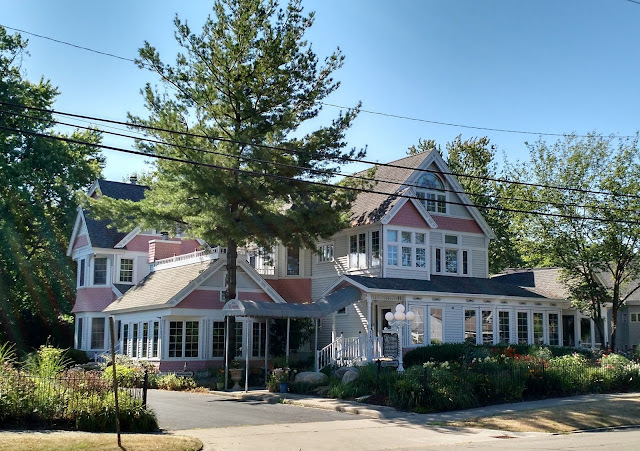 On Sunday morning, we had one more delicious breakfast at Yelton Manor, and I took a long run along the Kal-Haven Trail, a 34-mile trail between South Haven and Kalamazoo, before taking one more dip into Lake Michigan. I wish I had more time to explore South Haven and the surrounding area. 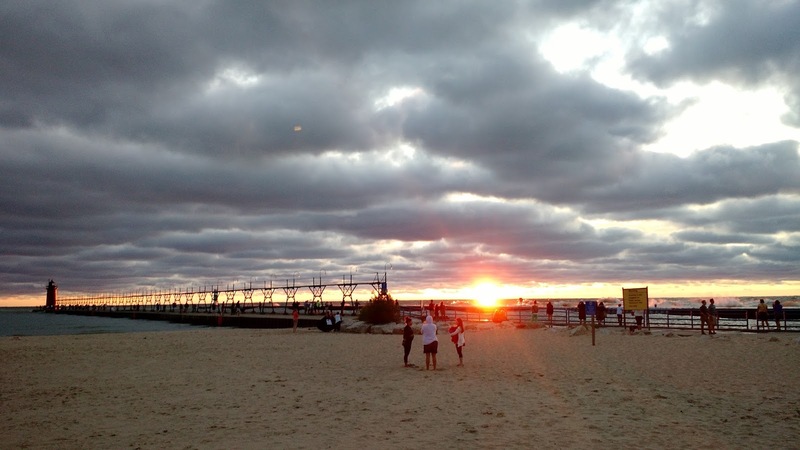 I look forward to standing on South Haven's shores again, absorbing fresh air and brilliant sky as the sun sinks slowly into Lake Michigan. Thank you, Marianne. After one visit, I can see why you love it!